Student selected for Chronicle of Higher Education reporting workshop in D.C.
Devna Bose, journalism major and Daily Mississippian managing editor, was selected by the Chronicle of Higher Education for its reporting workshop in Washington, D.C.
During the workshop on Sept. 6 and 7, Bose networked with talented editors and student journalists from all over the nation, and learned tips for reporting about higher education, like how to find and read college form 990s. The Chronicle paid all expenses for the students selected. In the photo above, Bose is getting help finding resources for a story from one of the Chronicle editors. The photo below is of all the students participating in the workshop. For many college students, the idea of working in the magazine industry is a dream, but not a reality. That’s because many can’t afford to work for free and don’t have money to cover expensive housing costs in New York City, even if they were awarded an internship. Dr. Samir Husni, professor, Hederman Lecturer, and director of the Magazine Innovation Center at the University of Mississippi’s Meek School of Journalism and New Media, is trying to change that. 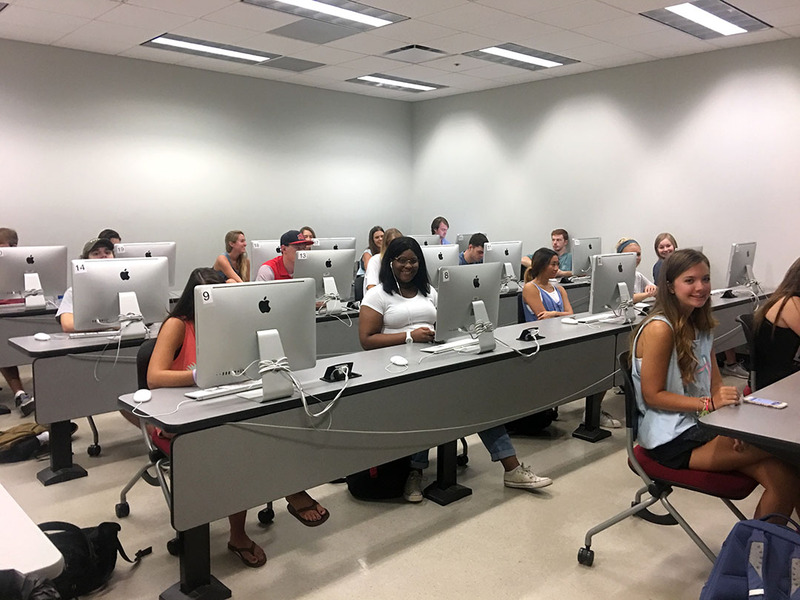 Husni’s Magazine Innovation Center has teamed with the MPA: Association of Magazine Media to create an endowment to help magazine students with financial needs pursue their dreams. 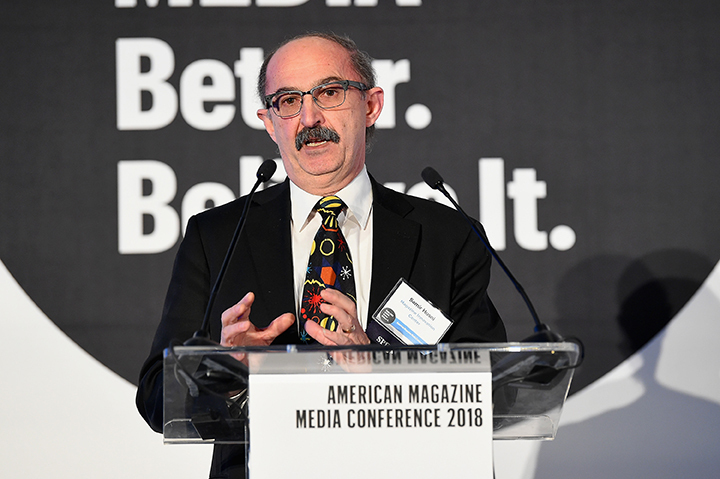 Husni recently shared the idea with magazine executives during the American Magazine Media Conference in New York City Feb. 6. “I was humbled and proud at the same time standing on that stage and talking about the University of Mississippi and our school of journalism,” he said. 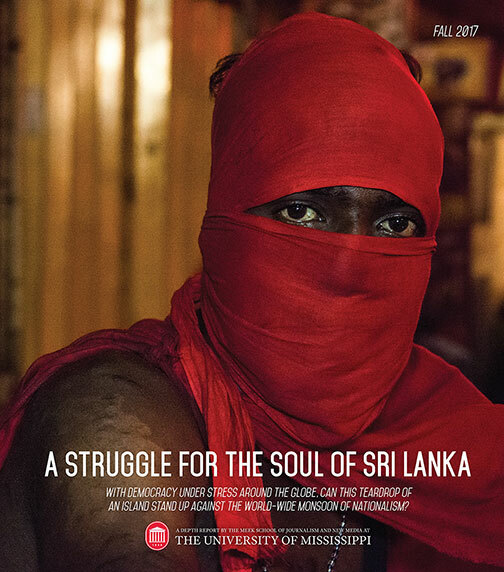 The endowment will start with $25,000 from the MPA: Association of Magazine Media Foundation. Husni will also work to raise funds through sponsorships from the ACT Experience, his Magazine Innovation Center’s annual magazine industry event. Part of the sponsorship funds are used to help students. Husni said he’s always felt that some students didn’t have equal access to magazine internships that can be very costly considering all expenses involved. Husni has a busy season ahead of him with magazines. He is currently preparing for the ACT 8 Experience, an event organized annually by the Magazine Innovation Center at the University of Mississippi’s Meek School of Journalism set for April 17-20 in Oxford. The 2018 theme is Print Proud, Digital Smart. And Newell Turner, one of Husni’s former University of Mississippi magazine students, who rose to become the Hearst Design Group editorial director, will be presented the Silver Em, the University of Mississippi’s highest award in journalism, at a campus event during the ACT 8 Experience April 18. The event will be held in the Overby Auditorium in Farley Hall on the UM campus at 5:30 p.m. If you are interested in donating to the endowment or learning more about it, contact Husni at 662-915-1414, 662-832-6247 or samir.husni@gmail.com. 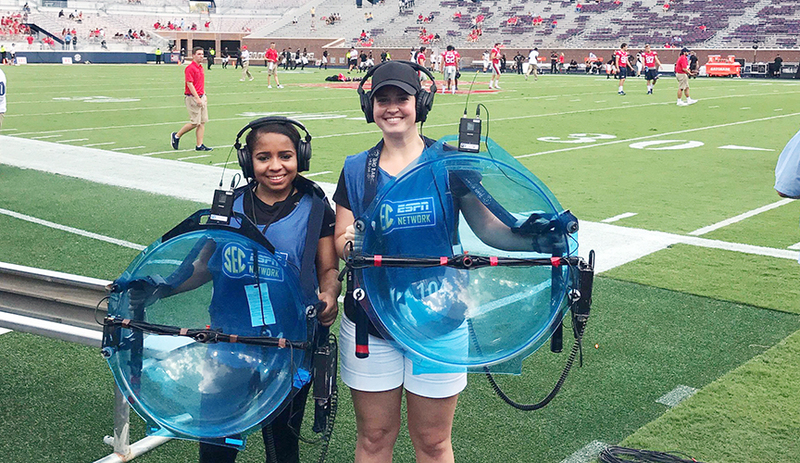 Football games are kind of like a family reunion, and the Meek School of Journalism and New Media is part of the University of Mississippi family. This fall, game days will offer an opportunity for Meek School students, alumni and faculty to reconnect and network during three themed events. 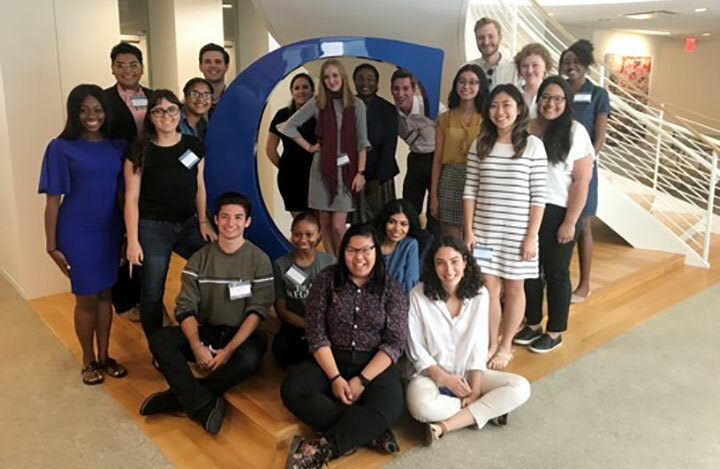 “We thought it would be fun to bring smaller groups of our graduates and students together so they could network, reminisce and reconnect with each other and some of their favorite professors,” said Debora Wenger, assistant dean for innovation and external partnerships, and associate professor of journalism. The IMC program saw its first graduates walk across the stage in 2013. IMC Alumni Day is a chance for everyone with an IMC degree to come help celebrate the growing IMC program and alumni success. 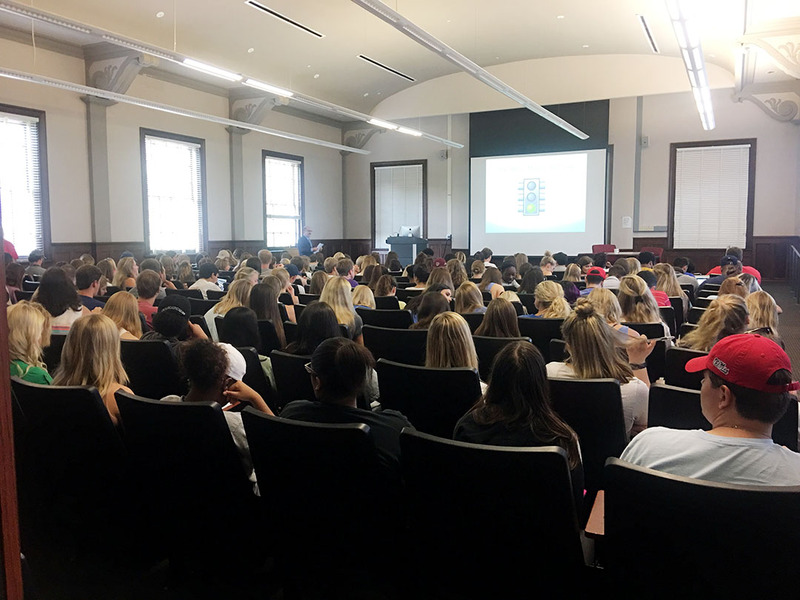 “We hope the IMC event brings some of our alums back to campus, helps them connect with current students, and gives us a chance to highlight some of the new things happening with our program,” said Scott Fiene, assistant dean for curriculum and assessment, and assistant professor of IMC. The Daily Mississippian and The Ole Miss yearbook have been part of the university for more than 100 years. Event organizers hope to see anyone who has ever worked on these publications join others in the Grove before the game. UM broadcast journalism graduates are working in TV, radio, movies and many other exciting careers. They are invited to come back to campus to talk about what they’re doing and meet and encourage other students who want to follow the same path. The events are open to everyone, including prospective students who want to stop by to inquire about the journalism and IMC programs. For more information about the programs or events, email meekschool@olemiss.edu or call 662-915-7146. 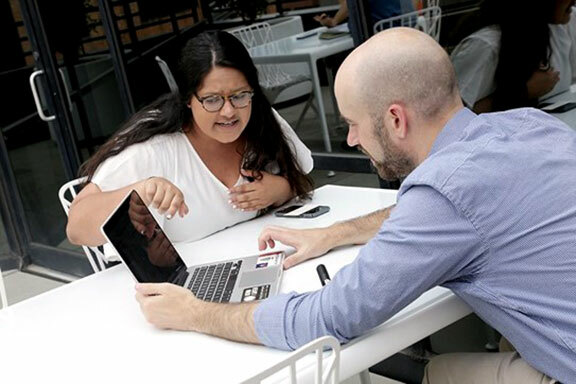 The Tab is offering a remote internship recognized by leading media companies and journalism schools, available to the most talented student journalists and writers. Interns will provide sharp local news reporting and features on campus life. Tab interns produce at least one story a week for The Tab. They work with a campus editor and a professional journalist in New York to write quality stories with original angles. Rewards include limited edition Tab merchandise, LinkedIn recommendations from senior journalists, and internship opportunities at The Tab’s New York office and our media partners. The Tab is a student news site run by young journalists. We manage local sites at more than 80 universities in the US and UK. Each site is run by a team of student editors and reporters, who write stories, socialize, and grow a huge engaged audience on their campuses. They are backed up by a professional staff at offices in New York and London. Their job is to support our journalists with education, career and internship opportunities and powerful technology. To apply, please send a cover letter and resume to Rob White, rob.white@thetab.com. The University of Mississippi Communications Department is seeking an undergraduate intern for Fall 2017. This creative position supports the graphic design team with the conceptualization and execution of materials used by various departments on campus, in addition to national marketing and advertising campaigns. The ideal candidate should value creativity, be deadline-oriented, work well in a team, take directions well and be familiar with Adobe Creative Suite. Do you always have ideas about how a company can leverage their social media presence? Do you want experience being a social media/marketing manager? Want to have practical hands on experience running Facebook ad campaigns? Do you want to come up with detailed ideal client profiles that makes finding, serving, and connecting to a business’s ideal customers easy? Then you might be the perfect person to be the Social Media/Marketing Manager Intern we’re looking for. Brave Communication is Oxford’s Premier Leadership Development and Executive Coaching firm. We lead middle and senior level managers into the relationships needed to have the success in their careers. •	How to create a long term social media plan and marketing calendar. •	Relationship building with our online community by maintaining Facebook, Twitter, LinkedIn, and other media accounts. •	How to track social media analytics using Hootsuite/Buffer and other software, and report results and new ideas to owner. •	Create compelling content that will be shared by influencers. •	Assist business owner in building and presenting social media strategy. •	Background in Marketing, Communication, English, Journalism, Business, or other related discipline. •	Professionalism in speech and written content. •	Proficient in Microsoft Suite Office. •	Familiarity with social networking sites desired, but we will also train. •	Interest in developing leaders of tomorrow. Interested individuals should send an email of interest to Julia Winston. The internship dates are May 1, 2017 -August 31, 2017, working a minimum of 15 hours per week. The person hired will NOT have to be based in Oxford. Academic credit only. Rebel Radio is a student-run organization that broadcasts throughout much of North Mississippi and enables students to gain broadcasting experience by becoming volunteer interns. Just like any other radio station, anyone can tune in and listen to sports, music, local or world events and news. Hernando native Aaron Isom, a University of Misissippi junior majoring in broadcast journalism, is also a former Oxford Stories reporter. He is from Hernando and attended Northwest Community College two years before transferring to UM. Isom became interested in broadcasting when he was young. “I always thought broadcasters had a cool job, even when I was little,” he said. In high school, he was a part of the student news team. “The show came on every morning, and it proved to me that broadcasting was something I was very interested in,” he said. Isom continued his journalism career at Northwest Community College, where he worked at the local newspaper distributed throughout Tate County while attending Northwest. On Mondays at 5 p.m., Isom is on the air for an hour. On Thursdays at 8 p.m., he works for two hours. Isom said he’s not sure a lot of people realize how far-reaching Rebel Radio is. The station even airs in the Memphis metro area. Although one cannot see Isom’s face when he is on air, he believes working at Rebel Radio will lead to bigger broadcasting opportunities. Isom said he wants to become a broadcaster at a big sports network. Jackson Maddox, 21, is originally from Houston, Texas. He worked at Rebel Radio last semester and switched his major to broadcast journalism before the beginning of the fall semester of 2016. Maddox discovered Rebel Radio last summer. Jackson Maddox. Photo by Jack Newsom. Maddox had two segments each week at Rebel Radio on Tuesdays and Fridays. On Thursdays, Maddox played his own music. “I really loved picking music for people to listen to,” he said. Maddox said he job was fun, and he would encourage any student to become involved. Story by Jack Newsom, Oxford Stories, jsnewso2@go.olemiss.edu.